Being one with the universe for some is more real than just a deeply profound spiritual statement. It is a way of living this life from a place of love and spiritual awareness, where one can see through illusions of separation and the so called hierarchy among other life forms and intelligences that co-inhabit this sacred space we share. 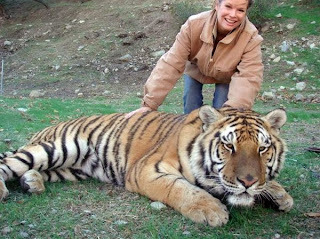 Amelia Kinkade is an Animal Communicator who has dedicated her to the welfare of animals. She starred in couple of Horror flicks early on in her life which made her quite popular and well known in the social circuit. Shortly after her starring role in Night of the Demons Part 1, Amelia discovered her astonishing abilities in being able to enter not only the minds of the wild characters she plays in the movies, but also the minds of wild animals. She went on to create history in the publishing world as well--first by making the controversial world of animal communication main-stream with her books and popular seminars, then by publishing three books on Amazon in one day! Amelia is the author of Straight From the Horse’s Mouth: How to Talk to Animals and Get Answers and The Language of Miracles: A Celebrated Psychic Teaches You to Talk to Animals (RandomHouse and New World Library), Soulmates with Paws, Hooves, and Wings; Aurora's Secret; and The Winged One. Chi Master : John Chang ~ The Magus of Java ! Something Unknown is doing, We don't know what ? !